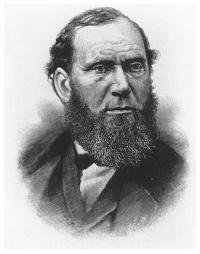 Allan Pinkerton was a famous nineteenth-century detective and founder of the Pinkerton National Detective Agency. Pinkerton served as a spy during the U.S. Civil War and was renowned for preventing the assassination of President-Elect Abraham Lincoln in 1861. He became a controversial figure when large companies hired his "Pinkerton men" to break Labor Union strikes through the use of intimidation and violence. Pinkerton was born on August 25, 1819, in Glasgow, Scotland. His father was a police sergeant, but as a young man Pinkerton did not seek a police job. Instead he apprenticed as a cooper and learned to make barrels. In 1842, after he completed his apprenticeship, Pinkerton emigrated to the United States. He settled in Chicago and set up a cooper's shop. In 1843 Pinkerton moved his business to Dundee, in Kane County, Illinois. In that year he discovered and captured a gang of counterfeiters. The event changed Pinkerton's life. He became involved with police work and was appointed deputy sheriff of Kane County in 1846. He soon shifted to a similar position in Cook County, with headquarters in Chicago. In 1850 he resigned as a deputy and started the Pinkerton National Detective Agency. This private detective agency, which specialized in railroad theft cases, became the most famous organization of its kind. Pinkerton soon opened branches in several cities. In 1866 his agents recovered $700,000 stolen from the Adams Express Company and captured the thieves. Pinkerton's public image was enhanced by his discovery in 1861 of a plot to assassinate Abraham Lincoln as the president-elect traveled by train from Springfield, Illinois, to Washington, D.C. With the outbreak of the Civil War, Pinkerton entered the Union army as a major. He was commissioned by General George B. McClellan to create a Secret Service of the U.S. Army to investigate criminal activity, such as payroll thefts and murder. Pinkerton also headed an organization, under the name E. J. Allan, that worked to obtain military information in the Southern states. Following the Civil War, Pinkerton returned to his detective agency. His agency soon became an integral part in the wars between labor and management that became common in the 1870s. States enacted laws that gave corporations the authority to create their own private police forces or to contract with established police agencies. Pinkerton created groups of armed men known as Pinkerton men, who were contracted out for a daily fee to corporations with labor problems. Their menacing attitudes and use of violence were despised by labor unions and their supporters. In 1877 the United States was beset by a number of railroad strikes. Pinkerton's agents were used as strikebreakers, and their harsh actions toward the labor unions were criticized. James McParlan, a Pinkerton agent, infiltrated the Molly Maguires, a secret organization of Pennsylvania and West Virginia coal miners. From 1872 to 1876, McParlan became part of the Molly Maguires, who were responsible for Terrorism in the coal fields. He later testified in a series of trials that led to the conviction and hanging of ten men for murder. Pinkerton, an unabashed self-promoter, wrote an account called The Molly Maguires and the Detectives (1877). In 1878 he wrote Strikers, Communists and Tramps in which he defended the use of his agents as strikebreakers, arguing that he was protecting workers by opposing unionism. He wrote about his role in foiling the Lincoln assassination in The Spy of the Rebellion (1883) and his autobiography Thirty Years as a Detective (1884). Pinkerton died on July 1, 1884, in Chicago. Mackay, James. 1997. Allan Pinkerton: The First Private Eye. New York: J. Wiley & Sons. PHILADELPHIA -- It's time to be clear about the benefits of hormone therapy for many women in midlife, JoAnn Pinkerton, MD, executive director of the North American Menopause Society, said during the keynote address at the group's annual meeting. Pinkerton, who is also a professor of obstetrics and gynecology at the University of Virginia. Neil Frederick Pinkerton denies two counts of causing unnecessary suffering to a dog and a third relating to a fox. In 1856, 23-year-old Kate Warne walked into the Pinkerton Detective Agency to apply for a job. Chris Enss's The Pinks offers an engrossing look at the women's flank of the famed Pinkerton group, which provided services of security, protection, investigation, and, in many cases, infiltration by its initially all-male staff of "private eyes. Jon Pinkerton was locked up for 32 months for possessing and making 5,538 indecent images of children. He had humble beginnings in Glasgow and, after his police sergeant father died when he was a child, Allan Pinkerton grew up in poverty. Lincoln's Spymaster: Allan Pinkerton, America's First Private Eye. Glaswegian Pinkerton (1819- 1884) became the first private eye in Chicago in 1852. Gordon Pinkerton, 68, preyed on children for most of his adult life, subjecting them to horrific abuse at houses across Scotland. Orkin's fuzzy-faced helper answers to the name Pinkerton (like the detective agency). Hans Pinkerton fled the region more than two years ago as police probed a suspected pounds 30,000 con at a motor dealers.